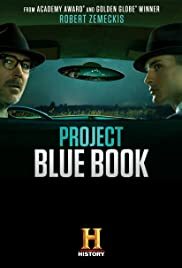 Writers: David O'LearyStars: Aidan Gillen, Michael Malarkey, Laura MennellSummary: In this conspiratorial Sci-Fi thriller set some time after WWII and loosely based on the US government's real life Project Blue Book, Captain Michael Quinn and Dr. Allen Hynek are tasked by the US Air Force to investigate reports of UFOs and debunk them, or at least come up with rational explanations for them. While Quinn, a smooth and tough military type, doesn't care about anything other than doing the job he was given, at first, the more skeptical Hynek quickly becomes convinced that some kind of deadly conspiracy is afoot. Meanwhile, as Cold War paranoia spreads among the population, a charismatic blonde with an agenda of her own befriends Hynek's lonely wife.